The synthesis and secretion of adiponectin is increased by activation of the nuclear receptor PPAR-alpha, and reduced by caloric excess, presumably associated with leptin deficiency or resistance. Once released, adiponectin can directly increase fatty-acid transport, oxidation and dissipation in skeletal muscle, reducing the levels of intramyocellular lipids, thus improving insulin signaling. The protein can also increase the sensitivity of the hepatocyte to insulin, either through a direct action, or indirectly by lowering circulating lipids due to its action on muscle. Thus, administration of adiponectin can result in improved insulin sensitivity and glucose tolerance, and can correct hyperglycemia associated with obesity. The four modified lysines (residues 68, 71, 80, and 104) in the collagenous domain of adiponectin are conserved across all of the species investigated. The mouse, human, bovine, monkey, and dog adiponectin sequences relate to GenBankTM/EBI accession numbers BAB22597, AAK58902, AAK92202, and AAL09702, respectively. The four modified lysines and their surrounding motifs are shaded. Adiponectin (ADP) is an adipocyte hormone involved in glucose and lipid metabolism. We detected a rise in ADP in cerebrospinal fluid after intravenous (i.v.) injection, consistent with brain transport. In contrast to leptin, intracerebroventricular (i.c.v.) administration of ADP decreased body weight mainly by stimulating energy expenditure. Full-length ADP, mutant ADP with Cys39 replaced with serine, and globular ADP were effective, whereas the collagenous tail fragment was not. Lepob/ob mice were especially sensitive to i.c.v. and systemic ADP, which resulted in increased thermo genesis, weight loss and reduction in serum glucose and lipid levels. ADP also potentiated the effect of leptin on thermo genesis and lipid levels. While both hormones increased expression of hypothalamic corticotropin-releasing hormone (CRH), ADP had no substantial effect on other neuropeptide targets of leptin. In addition, ADP induced distinct Fos immuno-reactivity. Agouti (Ay/a) mice did not respond to ADP or leptin, indicating the melanocortin pathway may be a common target. These results show that ADP has unique central effects on energy homeostasis. Adiponectin (also known as 30-kDa adipocyte complement-related protein; Acrp30) is a hormone secreted by adipocytes that acts as an anti diabetic and anti-atherogenic adipokine. Levels of adiponectin in the blood are decreased under conditions of obesity, insulin resistance and type 2 diabetes. Administration of adiponectin causes glucose-lowering effects and ameliorates insulin resistance in mice. Conversely, adiponectin-deficient mice exhibit insulin resistance and diabetes. 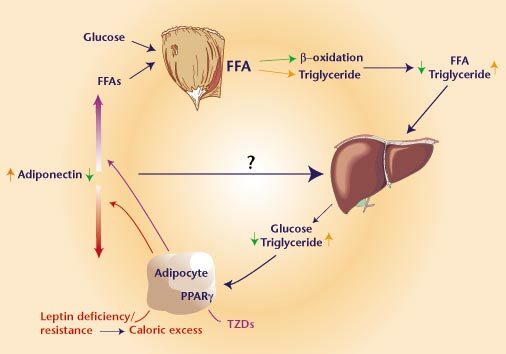 This insulin-sensitizing effect of adiponectin seems to be mediated by an increase in fatty-acid oxidation through activation of AMP kinase and PPAR-alpha. Here we report the cloning of complementary DNAs encoding adiponectin receptors 1 and 2 (AdipoR1 and AdipoR2) by expression cloning. AdipoR1 is abundantly expressed in skeletal muscle, whereas AdipoR2 is predominantly expressed in the liver. These two adiponectin receptors are predicted to contain seven trans membrane domains, but to be structurally and functionally distinct from G-protein-coupled receptors. Expression of AdipoR1/R2 or suppression of AdipoR1/R2 expression by small-interfering RNA supports our conclusion that they serve as receptors for globular and full-length adiponectin, and that they mediate increased AMP kinase and PPAR-alpha ligand activities, as well as fatty-acid oxidation and glucose uptake by adiponectin. OBJECTIVE: We investigated the acute responses of plasma adiponectin levels to a test meal in lean and obese subjects. RESEARCH METHODS AND PROCEDURES: We studied 13 lean and 11 obese subjects after a 10-hour overnight fast. Glucose, insulin, and adiponectin concentrations were measured at baseline and 15, 30, 60, 120, and 180 minutes after a fixed breakfast. RESULTS: At baseline, fasting adiponectin concentrations were lower in the obese group vs. the lean group [mean (95% confidence interval): 2.9 (2.1 to 4.1) micro g/mL vs. 8.6 (6.5 to 11.3) micro g/mL], but rose 4-fold postprandially in the obese group, reaching a peak at 60 minutes [baseline: 2.9 (2.1 to 4.1) micro g/mL vs. 60 minutes: 12.1 (8.5 to 17.4) micro g/mL; p< 0.0001] and remaining elevated for the remainder of the study. There were no postprandial changes in plasma adiponectin concentrations in lean subjects. DISCUSSION: This increase of adiponectin concentrations in obese individuals might have important beneficial effects on postprandial glucose and lipid metabolism and might be viewed as a mechanism for maintaining normal glucose tolerance in those who are obese and insulin resistant. Presently surgery is the most effective way to obtain a controlled weight reduction in morbidly obese patients. Roux-en-Y gastric bypass (RYGBP) surgery is effective and used worldwide, but the exact mechanism of action is unknown. The effect of RYGBP on ghrelin, insulin, adiponectin, and leptin levels was investigated in 66 obese subjects; mean weight 127 kg (range, 96-195 kg) and mean body mass index (BMI) 45 kg/m(2) (range, 33-64) before and after surgery. Ghrelin levels were also compared in 10 non operated and 10 operated obese, BMI-matched women. RYGBP resulted in 22% and 30% weight loss at 6 and 12 months, respectively. Ghrelin increased by 44% and 62% and adiponectin by 36% and 98%, but insulin declined by 57% and 62% and leptin by 60% and 64%. The changes were all related to the reduction in BMI. In addition, ghrelin and insulin were inversely correlated at all time points as were changes of the peptides at 12 months (F = 4.9, P = 0.031), independent of the change in BMI. No evidence for RYGBP surgery per se having an effect on ghrelin levels, independent of weight loss, was obtained. The profound changes in the regulatory peptides are likely to reflect the new state of energy balance achieved. A close inverse association between ghrelin and insulin was observed, supporting an important role for ghrelin in glucose homeostasis. Adiponectin has recently been shown to be a promising candidate for the treatment of obesity-associated metabolic syndromes. Replenishment of recombinant adiponectin in mice can decrease hyperglycemia, reverse insulin resistance, and cause sustained weight loss without affecting food intake. Here we report its potential roles in alcoholic and nonalcoholic fatty liver diseases in mice. Circulating concentrations of adiponectin decreased significantly following chronic consumption of high-fat ethanol-containing food. 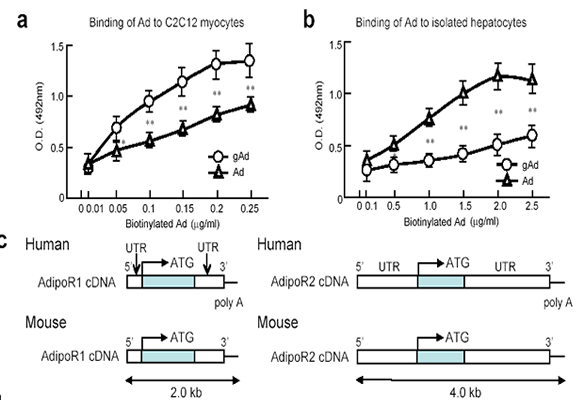 Delivery of recombinant adiponectin into these mice dramatically alleviated hepatomegaly and steatosis (fatty liver) and also significantly attenuated inflammation and the elevated levels of serum alanine aminotransferase. These therapeutic effects resulted partly from the ability of adiponectin to increase carnitine palmitoyltransferase I activity and enhance hepatic fatty acid oxidation, while it decreased the activities of two key enzymes involved in fatty acid synthesis, including acetyl-C oA carboxylase and fatty acid synthase. Furthermore, adiponectin treatment could suppress the hepatic production of TNF-alpha and plasma concentrations of this pro inflammatory cytokine. Adiponectin was also effective in ameliorating hepatomegaly, steatosis, and alanine aminotransferase abnormality associated with nonalcoholic obese, ob/ob mice. These results demonstrate a novel mechanism of adiponectin action and suggest a potential clinical application of adiponectin and its agonists in the treatment of liver diseases. Intimal thickening of injured arteries in adiponectin-deficient mice. A, representative hematoxylin and eosin-stained sections (upper panel) and -smooth muscle-actin immuno-stained sections (lower panel) of femoral arteries of WT and adiponectin knockout (APN-KO) male mice (8-10 weeks old) harvested at 3 weeks after injury. Arrows indicate internal elastic lamina. B, I/M ratio in the injured arteries of WT (n = 7, ±S.E.) and APN-KO (n = 5, ±S.E.) mice (p < 0.01, t test). Effects of adiponectin treatment on food intake, body weight gains, and circulating levels of glucose and insulin. (a) Serum adiponectin levels in mice fed with LC diet, LE diet, or LE diet plus adiponectin infusion (LE + Ad), as described in the text (n = 5). Serum samples were collected at different times following adiponectin treatment. (b) Food intake in LE diet mice treated with or without adiponectin (n = 6). (c) Average daily body weight gains over 2 weeks of adiponectin treatment (n = 6). (d) Fasting glucose levels over adiponectin treatment period (n = 6). (e) Fasting plasma insulin levels over adiponectin treatment period (n = 6). Note that adiponectin and alcohol treatment also have no obvious effects on plasma levels of insulin and glucose in the fed state (data not shown). *P < 0.001 for adiponectin-treated group versus other two groups. Adiponectin treatment ameliorates alcohol-induced dyslipidemia and hepatic abnormality in mice. Serum samples were collected after 5 weeks of LC diet, LE diet, or LE + Ad diet in the last 2 weeks. Serum levels of TG (a) and FFA (b), liver-to-body weight ratio (c), hepatic TG contents (d), and plasma ALT levels (e) were determined at necropsy (n = 5). #P < 0.05, ##P < 0.01 for LC-treated mice versus LE-treated mice; *P < 0.05, **P < 0.01 for LE + Ad–treated mice versus LE-treated mice. Adiponectin treatment decreases alcohol-induced elevation of hepatic TNF-Alpha expression and its plasma concentrations. (a) Total RNA from livers of mice treated with LC diet, LE diet, or LE + Ad diet was extracted and subjected to Northern blot analysis. (b) The results from a were quantified by Phosphor Imaging (n = 5). All RNA levels are expressed relative to untreated LC pair-fed controls, after being normalized against the abundance of 18S RNA. (c) Plasma concentrations of TNF-Alpha as measured at necropsy (n = 5). **P < 0.01 for LE + Ad–treated mice versus mice receiving LE diet alone. Endogenous adiponectin secreted by 3T3-L1 adipocytes exists as eight iso forms. The medium from sub confluent 3T3-L1 preadipocytes (A) or adipocytes at day 8 after induction of differentiation (B) was collected and concentrated as described under "Experimental Procedures." 50 µg of proteins from each sample was separated by two-dimensional gel electrophoresis and visualized by silver staining. The proteins preferentially secreted by adipocytes are denoted by numbered arrows. Secretory proteins from adipocytes separated by two-dimensional gel electrophoresis as described above were detected using rabbit anti-adiponectin antibody (C) or the Immu-Blot carbohydrate detection kit (D). Note that all eight indicated proteins are immuno-reactive with anti-adiponectin antibody. Six of the eight iso forms (spots 3-8) of adiponectin are glycosylated. Fractionation and characterization of the tryptic peptides of adiponectin by RP-HPLC, MALDI-TOF-MS, and amino acid sequencing. All of the glycosylated iso forms of adiponectin separated by two-dimensional gel electrophoresis were excised from the gels, pooled, and digested with trypsin. The tryptic peptide mixture was separated by RP-HPLC. Each fraction was collected and analyzed by MALDI-TOF-MS. The three fractions containing peptides with masses of 1679, 4276, and 4260 Da are denoted as A-C, respectively. The table shows the amino acid sequences, the experimentally observed masses, the theoretical masses, and the mass differences for these three peptides. MALDI-TOF mass spectra of tryptic peptide mixtures derived from different iso forms of adiponectin. Iso forms 1 (A) and 3 (B) of adiponectin secreted by adipocytes were in-gel digested with trypsin, and the tryptic mixtures were analyzed by MALDI-TOF-MS. Note that the three peptides (with masses of 1679, 4260, and 4276 Da) denoted by arrows were reproducibly observed in all of the glycosylated iso forms (iso forms 3-8) produced by both adipocytes and COS-7 cells, and not in the two un glycosylated iso forms (iso forms 1 and 2) or the bacterially produced adiponectin. MALDI-TOF mass spectra of peptide mixtures from Asp-N-digested peptides B and C.
Peptides B (panel I) and C (panel II) separated in Fig. 3 were further digested with Asp-N and then analyzed by MALDI-TOF-MS. The peptide sequences and the potential modifications assigned to each mass are indicated above each peak. Note that the assignment of Pro94 as hydroxylated proline was also confirmed by amino acid analysis. GG, glucosylgalactosyl. Expression and carbohydrate detection of the FLAG-tagged Lys-to-Arg adiponectin variant. COS-7 cells were transfected with pcDNA-Ad-F or pcDNA-Ad(K R)-F. 48 h later, FLAG-tagged adiponectin or the Lys-to-Arg adiponectin variant was purified from the cell culture medium. 1 µg of protein from each sample was separated by 15% SDS-PAGE and stained with Coomassie Brilliant Blue R-250 (A) or detected with the Immu-Blot glycoprotein detection kit (B). Note that the majority of glycosylation was abolished in the Lys-to-Arg adiponectin variant. Effect of adiponectin and adiponectin variants on insulin-induced inhibition of glucose production in primary rat hepatocyte's. Upper panel, inhibition of hepatic glucose production following treatment with increasing amounts of insulin in the absence or presence of 20µg/ml adiponectin (Ad) or Lys-to-Arg adiponectin variant (Ad variant) generated from COS-7 cells or 20µg/ml bacterially produced adiponectin (pAd); lower panel, inhibition of hepatic glucose production following treatment with 50 pM insulin plus increasing amounts of adiponectin or the Lys-to-Arg adiponectin variant generated from COS-7 cells or bacterially produced adiponectin. The results are represented as decreased percentage of glucose production relative to the untreated cells and as means ?nbsp;S.D. (n = 4). Adipose tissue can have a substantial impact on systemic glucose homeostasis through production of bioactive molecules. 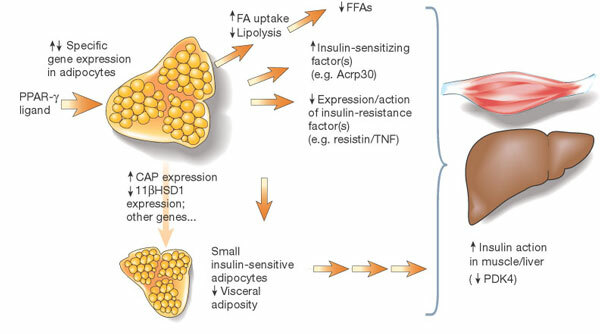 We examined serum concentrations of adipocyte-derived secreted proteins with postulated roles in obesity and insulin action. ACRP30 (30-kDa adipocyte complement-related protein)/adiponectin concentrations in the obese Jnk1 -/- mice were significantly higher than in Jnk1 +/+ controls (Fig. 2e). In contrast, the concentrations of resistin were lower in Jnk1 -/- mice than in Jnk1 +/+ animals (Fig. 2f). 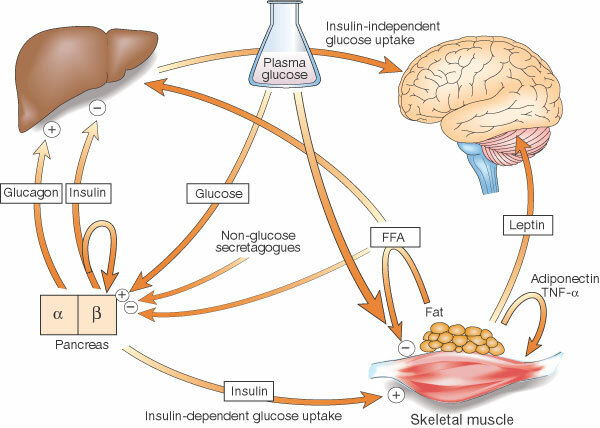 Because recent studies have indicated a role for adiponectin as a mediator of fatty-acid oxidation and hepatic insulin sensitivity and resistin is postulated to have a role in insulin resistance, these alterations could affect systemic insulin sensitivity. Fig. 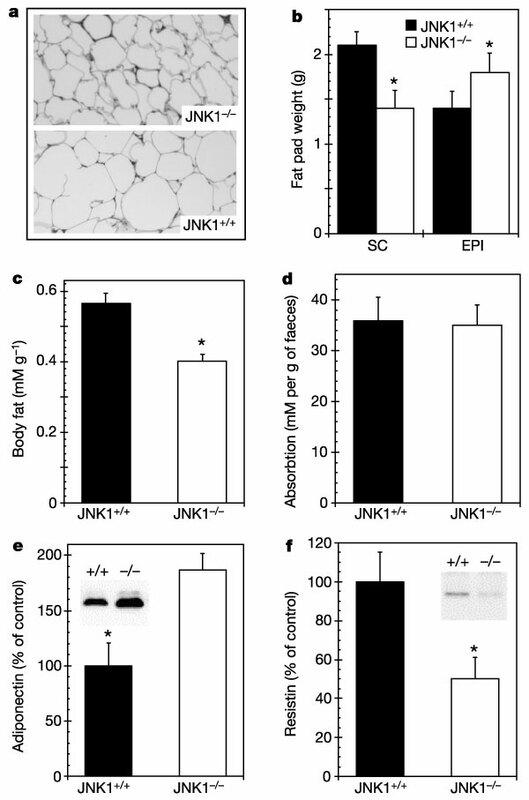 2 Adipose tissue morphology and adiposity in Jnk1 -/- mice and wild-type controls. a, b, Histological sections of epididymal fat pads (original magnification Alpha-50) (a) and subcutaneous (SC) and epididymal (EPI) fat pad weights (b) of 16-week-old male Jnk1 -/- and Jnk1 +/+ mice (n = 3 in a, n = 9 in b). c?b>f, Total body composition (c), faecal lipid content (d), serum adiponectin concentration (e) and resistin concentration (f) in Jnk1 -/- and Jnk1 +/+ mice. Representative immunoblots are shown in insets. Total carcass lipid analysis was performed 25 to determine fat mass of individual mice (n = 6 in each group). Asterisk, statistical significance (P < 0.05) in a two-tailed Student t-test comparing Jnk1 +/+ and Jnk1 -/- mice.